...But I Want to Be the World's Most Famous Cat Photographer! 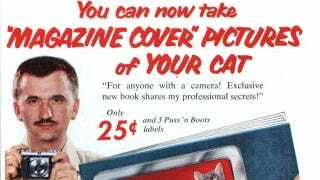 Back in 1955, Mr. Walter Chandoha was apparently the world's most famous feline-snapper, and understandably everyone wanted to know how he took "magazine cover pictures" of kitties. I'm mostly intrigued about learning "how to be sure they move."